Sentinel of Liberty arrives on the App Store ahead of movie release. The movie tie-in smartphone app is the new movie-tie in video game. The new Captain America release is both: A movie-tie-in-smartphone-app-video-game. 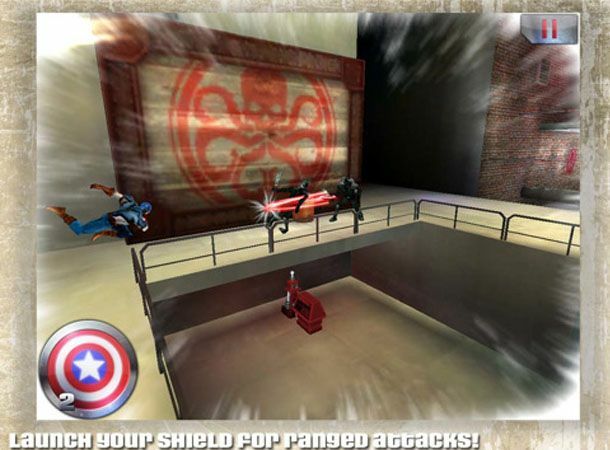 The Captain America: Sentinel of Liberty arrives on the iPhone offering you the chance to join the WWII effort as Cap travels behind enemy lines to rescue his buddies in a bid to stop the evil Red Skull tipping the balance of the war. You play as the patriotic comic book hero in an original story where you'll "execute wall runs, slide under traps, and unleash devastating combo attacks with dynamic intensity." The game features 24 levels, which will unfold over three episodes and HD graphics brought to life from original comic panes by Marvel artists. The game is available to download now for £2.99 and comes in iPad, iPhone and iPod touch flavours. An Android version of the app is coming soon.